The Creative Age: Painting "Go Gilda!" or, let's now make lemonade from the lemons of the oil spill. Painting "Go Gilda!" or, let's now make lemonade from the lemons of the oil spill. 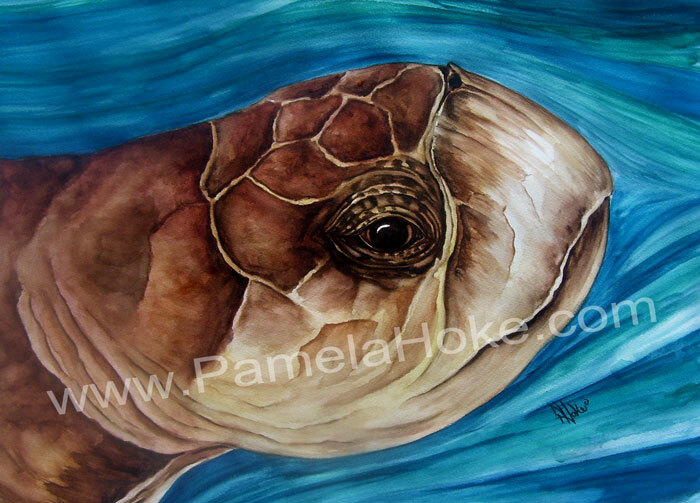 Yet another deeply emotional, visual journey into painting the soul of a sea turtle. "Go Gilda!" is finally done. I can't even describe the obstacles that were encountered to feel this turtle's presence enough to portray her... yet with perseverence in this mission, attendance at the compelling release event on Juno Beach this month, the incredible photos from Hospital Coordinator, Deb Mauser, and the help of all Gilda's caretakers, friendly volunteers and staff at Loggerhead Marinelife Center, ...this artwork now exists. Talk about being handed lemons, Gilda really got a raw deal...about 18 months ago, she lost big time in a boat encounter...literally. Her right flipper amputated, her left flipper also injured, severe injuries to her nose and beak, and more. Her outlook when discovered was not good at all. You can read her amazing journey from death's door to now healthy and free back in the ocean here, and, you can even track her in the ocean via the satellite online. Gilda was handed lemons of the most rotten kind, and endured a long painful journey of healing. She re-learned to swim with her one fixed up front flipper through extensive physical therapy. Nature always finds a way...I completely identified with Gilda and how she was still able to re-learn to swim. As an artist determined to paint, if I lost the use of my left hand, I would learn to paint with my right. And now, we, as the Oil Spill destroyed vital habitat and livelihoods, we, must re-learn a new way of thinking and behaving. Her recovery literally took a village...everyone is rooting for Gilda to hopefully find a mate to help carry on the endangered Loggerhead Sea Turtle legacy. She is a 1 in a 1,000 turtle - as only 0.1% of hatchling survive to adulthood - hence we all rooting for her. GO Gilda. I was determined create this painting to represent the large effort it took to get Gilda back into the ocean to do her part to preserve her species, yet also to demonstrate how we can all make lemonade when handed lemons. It takes spirit, it takes perseverance. The piece shows how I see her happy, feeling the rush of cruising through the currents once again - the place she had known for years. We face a long, painful journey this year and beyond. We have been handed some really rotten lemons, the Gulf Oil Spill. We are losing millions of creatures as we speak, they are gone. I do not want their deaths to be in vain. It is up to us to find a way to make lemonade, here. This is why I started OceansForLife.org (The Facebook Page is up now with full site to open later in June). Let's stop wallowing in these rotten lemons, stop being counterproductive by just pointing fingers and fueling the anger with negativity... let's just acknowledge and mourn what has happened and is going to continue to happen, and get on with the long journey of healing and recovery with strong mental attitudes. (Our sea creatures and the coastal economies need us to now more than ever). We must move forward positively. We can do this by all of taking simple steps in our daily lives, and changing our mindsets just a little. We can begin to make lemonade now, by simply ackowledging the phenomenally spiritual creatures like Gilda that we are soley responsible for destroying. (Yes, we all use the cars and power that demand the production of oil, that fueled the greed of oil companies, etc...the vicious cycle that can only change in the future if we change now) Sea turtles really are the ambassadors of our oceans (as my friends at LMC state it). They have been on earth before we were even a thought, they each have souls that are deeper than the ocean itself - just try being near one and you will feel it after looking into their eyes like I did. Loggerhead Marinelife Center is where you can have this encounter with a sea turtle - one you will never forget. So, as an artist still on a very determined mission to help us begin to follow Gilda's struggle, and make lemonade from lemons, I share with you "Go Gilda!" Enjoy! You can buy "Go Gilda!" artwork and her sea turtle friends in the Oceans For Life section of Pam's online store. Original art, prints, T's, Mugs, Canvas Shopping Bags and more. 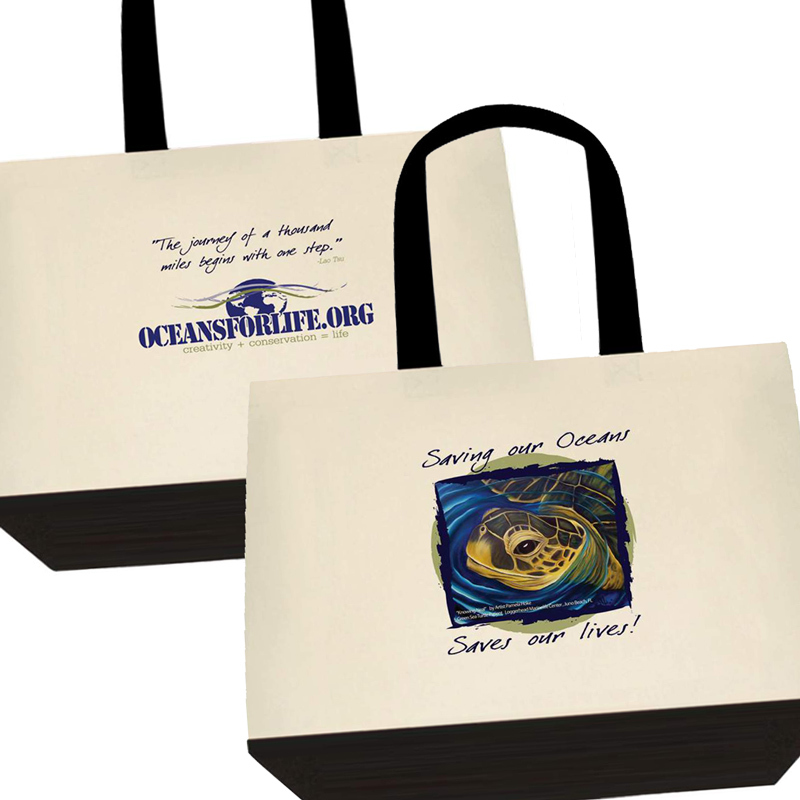 30% of proceeds will be donated to Loggerhead Marinelife Center for them to continue in their strong mission, and to assist in emergency rescue and clean up from the Gulf Oil Spill. 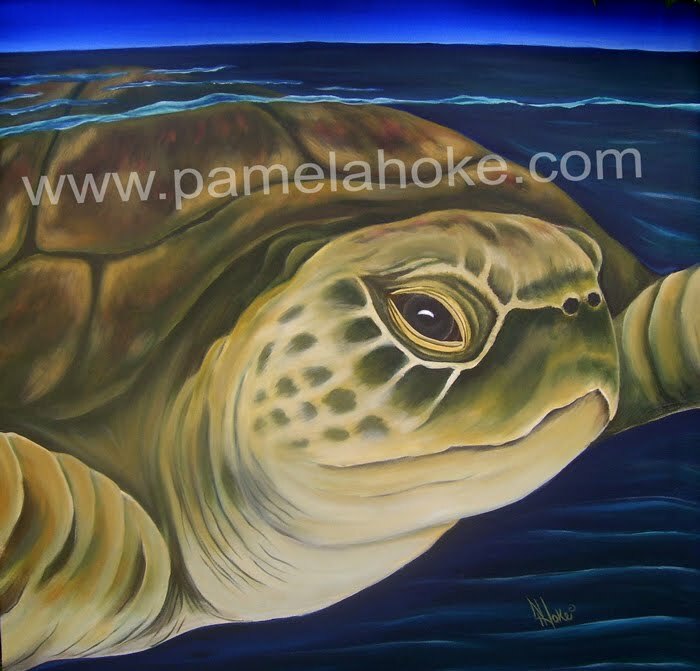 (Pam is actively seeking other partnering organizations to assist all marinelife and ocean advocacy groups through her potent portraits, so please contact her if interested. She has a list of more portraits and emotional paintings in line such as the Brown Pelican, Dolphins, Reef life, and more.). Purchasers of the originals will be listed as primary sponsors of her passionate project site: www.OceansForLife.org , also. Please spread the word, join the journey, and sign up to be notified when the online creative conservation discussions begin on Oceans for Life - or, start immediately by posting to the Facebook page.